The serenity and grandeur of Nepal attracts nearly one-half million visitors every year. This small, ancient, land-locked country (147,181 Sq. Km. ), nestled between two giants, India and China, is home to more than 27 million people, more than 60 ethnic groups, above 100 spoken languages, and many religions. From the north Nepal's sky high border with Tibet—to the south, where the Terai's jungles buzz just above sea level, Nepal offers the visitor so many different environments to explore, even in a short time. We are the only country to have 7 (UNESCO) World Heritage Sites, many situated within a 20 kilometer radius! After you have experienced ancient Kathmandu, you can take a day trip around the Kathmandu Valley, spend a weekend in the jungle of Chitwan National Park (a World Heritage Site), or trek deep into the Himalayas. Trekking options include: Everest Base Camp, Annapurna Sanctuary, Rara Lake (in Western Nepal's "wild west"), or the seldom-visited Nymba valley, to name just a few. And because of Nepal's diverse terrain and climate: from the world's deepest gorge (Kali-Gandaki) to the highest point on earth (Mt. Everest), one can explore this magnificent country all year round. Nepal, although small in size, possesses some of the most outstanding bio-diversity in the world, ranging from sub-tropical rain forests to alpine deserts. Climate ranges from tropical in the low lands, to arctic in the higher altitudes. Our seasons are winter (December-February), summer (March-May), Monsoon (June-August), autumn (September-November). With regards to the Monsoon period, it mostly rains at night, leaving the following days clean and fresh. Most of the northern belt of the Trans-Himalayan zone is rain-shadowed, therefore ideal for trekking. Nearly 14% of Nepal's total area is set aside as national parks and wildlife reserves. Although Nepal has less than 0.003% of the world's land mass, we have 10% of its birds (more than 800 species.) Impean Pheasant (Danphe) is our national bird, and the Rhododendren arboreum(Lali Gurans) our national flower. Nepal is also the home of many endangered species and wildlife. The Bengal Tiger,Greater One-horned Rhinoceros, Snow Leopard, Clouded Leopard, Red Panda, Wild Water Buffalo, Blue Bull, Brown Bear, Crocodiles, Assamese Macaque, Gangetic Dolphin, Wolf, Wild Elephants, Swamp Deer, Wild Yak, Tibetan Antelope--and the list goes on. We are a living cultural heritage, as dynamic and alive as the terrain: Shamanism, Pan-animism and Witch-craft are still practiced in remote regions. Temples, shrines, monuments and monasteries are very active with devotees burning butter-lamps, singing hymns, chiming temple bells and playing drums. Kathmandu valley consists of 3 ancient cities: Kathmandu, Bhaktapur and Patan. 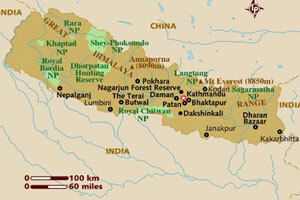 Kathmandu is the capital of Nepal and also the political, cultural, and commercial hub of the Kingdom. Its major places of interests are the Basantpur (Kathmandu Durbar Square), Pashupatinath, Budhanilkantha, Swayambhunath, Bouddhanath, the Rana palaces, and the historic city of Kirtipur. Patan, famous for its bronze and silverware, is located at the southern end of the Kathmandu Valley. Major highlights of Patan are the Patan Durbar Square, Krishna Mandir, Bath, Kumbheshwor Temple, the Golden Temple, and many other ancient, historic and artistic landmarks. Bhaktapur is located in the eastern end of the Valley, and is about 12 kilometers away from Kathmandu. It is a semi-fortified city that is famous for its Palace of 55 windows, the Golden Gate, Nyatapola Temple, Dattatreya Square and other historic monuments and heritage sites. Bhaktapur, renowned for its intricate woodcarvings and terra-cotta artistry, still preserves its precious culture and history. It is one of many "must-see" places of our country. Yet, as much as we love to show visitors our home country, we equally enjoy guiding them through neighboring regions of Bhutan, India's Darjeeling & Sikkim, and Tibet with Holy Mt. Kailash's grandeur waiting to intoxicate travelers with its magical beauty and culture. We can talk forever about the wonders of Nepal and the Himalayas, but we hope that you will see for yourself this splendid part of the world.